All game dollars gained in all game-modes will be doubled! Every player will have free premium during this period. Every player who logs in during this period will receive a free Halloween 2018 skinbox. Active during the entire event. We invite looters (Open World and Survival) to go and hunt for the new "Devil's Trident". This is a very rare melee that can only be found during these Halloween 2018 events. Brand new exclusive Halloween 2018 skins will be released. (CLICK HERE TO VIEW ALL SKINS) The skins will be findable in-game, available in the marketplace and in the Halloween 2018 skinbox. Throughout the entire event period the maps in Open World and Survival will be filled with scary Halloween secret spots. These spots have special Halloween loot such as skins, contracts, boxes, Halloween items, the devil's trident and more! Throughout the entire event period we will randomly release brand new Halloween 2018 themed character clothes. These will only be available during the event. During the Halloween Week the new Halloween 2018 skinbox will be released. The skinbox will be find-able in-game and available in the marketplace. 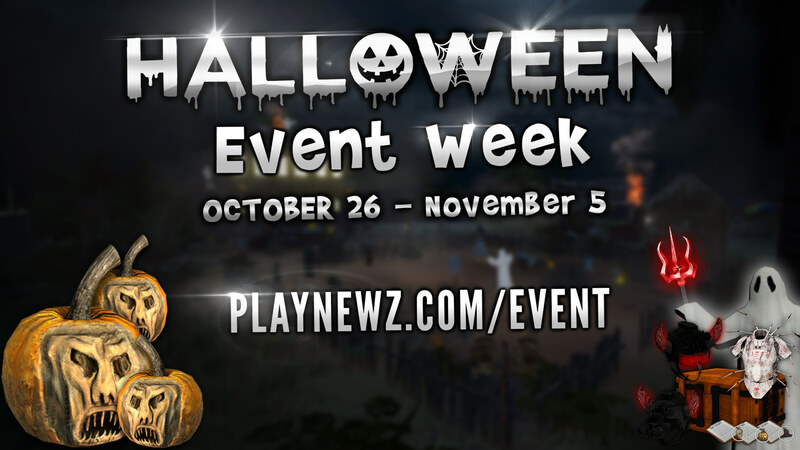 During the Halloween Week we will release 3 brand new Halloween contracts (Open World and Survival). These contracts will only be available during the event. Note: You can still finish / keep the contracts after the event has finished! During the Halloween week we will release the new "Grave Stone Barricade". This is a special themed barricade and can be used to get cover in fights. This is only in the Open World game-mode. During the Halloween week zombies will be equipped with random Halloween items. Special Halloween seasonal leaderboards for all game-modes. Rank 1,2 and 3 at the end of the event will receive a special "Halloween 2018 Trophy". CLICK HERE TO JOIN. Winner will be chosen in the comments at the end of the Halloween 2018 events. During the Halloween Week we will randomly do special sales. During the Halloween Week the main menu, game launcher, menu music and more will have a special Halloween theme. We are also doing some more unannounced events. Stay tuned on our social media channels for more information! This is probably one of our biggest events ever so we are really excited to see all your feedback. Make sure to let us know in the comments what you think! For now, have a nice weekend and enjoy the event! 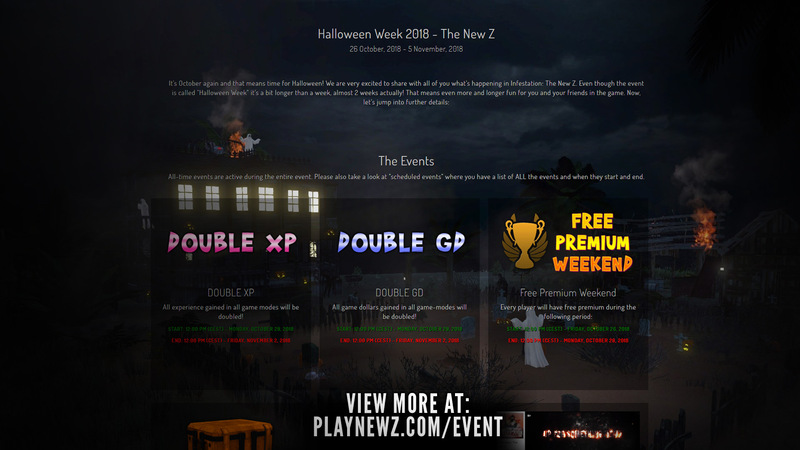 Note: Players that have forever premium / deluxe or extreme will receive a free Halloween 2018 skinbox upcoming Monday (when the free premium weekend event ends). Time for the NEXT PART of the Halloween events! DOUBLE XP + New Character: Steve! 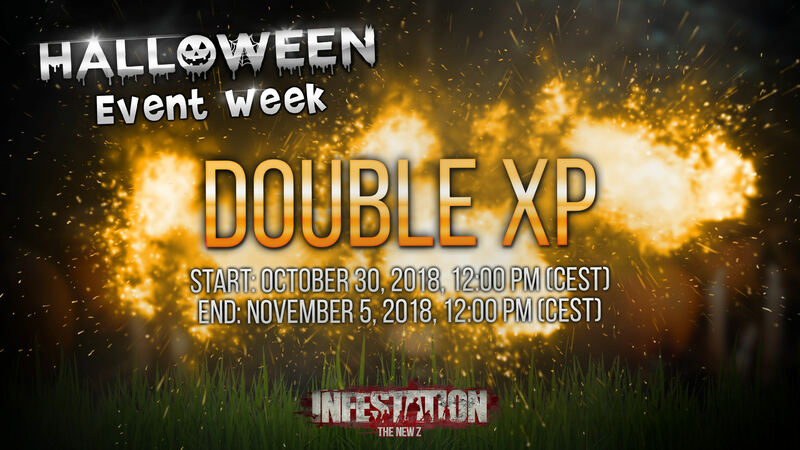 Double XP has started NOW and will end at November 5, 2018 12:00 PM (CEST) / End of Halloween 2018 events. We are aware of the private server issue: "no free servers available" Working on a solution as we speak. You have another large freaking issue. I spent some time this morning looting and such. I went to sleep and when I woke up, everything had bee rolled back! To be fair, I didn't lose much of great value, however I'd like to know why there was a rollback? I had 11 skull heads and a handful of pumpkins, along with a Halloween box. I'm loving the new PVE contracts. They are AWESOME!!! And now to the subject at hand. I also love the Halloween contracts. Would have been nice to have a special skin for the weapon indicated but, oh well. I found a contract to kill 200 zombies with the Devil's Trident. My question is this... Where in the world do we obtain the Devil's Trident? You can find the Devil's Trident at the Halloween secret spots in both Open World and Survival! Guys. Double XP event has been moved. It's starting already tomorrow now! Every player who has logged in during the past weekend has been rewarded with a free Halloween 2018 skinbox! Enjoy! Further news: TOMORROW at 12 we will start with the next event: DOUBLE XP! You can find the Devil's Trident at the Halloween secret spots in both Open World and Survival. I found the secret spot (NICE placement BTW) but can someone please explain how that all works? I have been there multiple times at all different times of the day and night and still can't seem to figure this out. It might be because of an issue I submitted to support where I had fire sounds but no visual of the fires, or I had visuals of the fires and no sound of the flames? The team has done a fantastic job this weekend and I must say getting the Halloween Week 2018 Started! I have been having nothing but a great time, and I just wanted to take a moment to give some genuine thanks. Keep up the great work here as I appreciate it very much and others I'm sure do the same and are just not as vocal. Sorry short correction: double XP starts tomorrow! Not GD! These spots are all over the maps in Open World and Survival. They spawn Halloween items like skins, boxes, items, contracts etc. The Devil's Trident is a very rare collectors item! Thanks for the feedback! Glad you like everything! free premium was a very good idea, I think this should be repeated more often. All the Weekend PvP was so funny because not only Veteran Players are on the Server. Edit: Have you ever considered making the revive time for free? 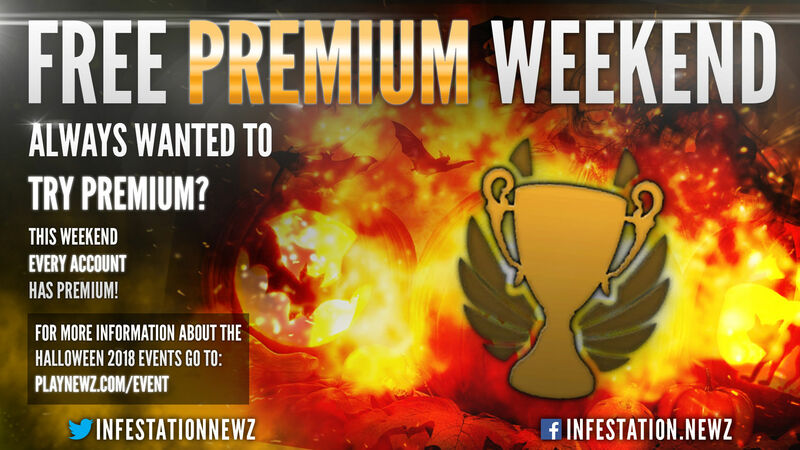 - This would bring a lot of new Players with it and you could bring a different function for the purchase of Premium. Every player who has forever premium, deluxe or extreme has been rewarded with a free Halloween 2018 skinbox as a compensation for the Premium Weekend we did. Enjoy! @Sven can we make the Halloween contracts after the Event too? Based on the issues players had during the weekend with their private servers we have a done a compensation for the NA / EU regions.